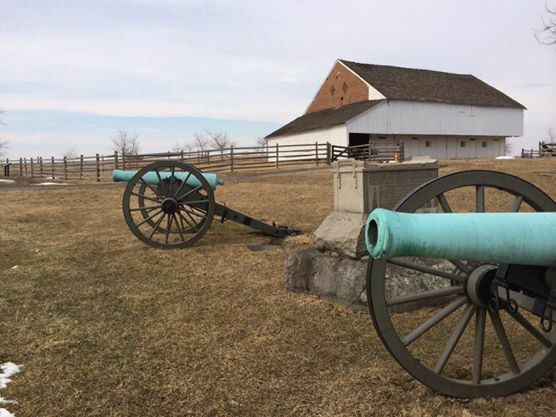 Today another excursion into my archives dealing with the Battle of Gettysburg as I muse about my Independence Day article. I hope you enjoy. The disaster that engulfed Sickles’ III Corps now threatened the Federal center. 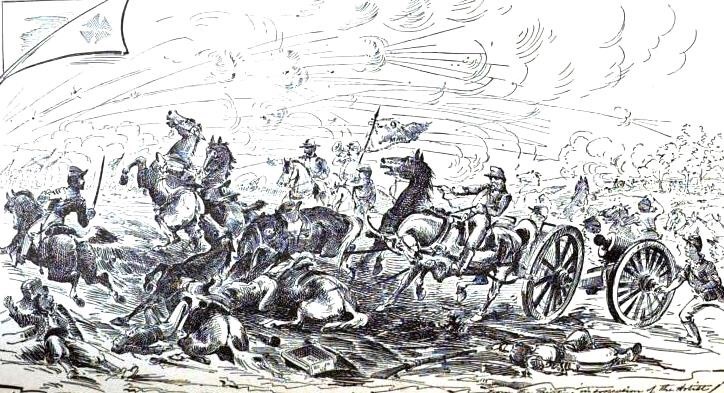 Meade and Hancock rushed reinforcements in the form of V Corps and much of II Corps. 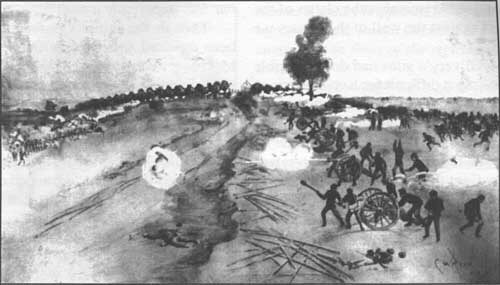 The tip of the Sickle’s salient at Sherfy’s Peach Orchard manned by Graham’s brigade of David Birney’s division was overwhelmed and retreated in disorder. Once “the angle had been breached, the lines connecting to it on the east and north were doomed.”  This exposed the left of Humphery’s division and it too was forced to retreat under heavy pressure sustaining heavy casualties. The final collapse of Humphrey’s division a large gap opened in the Federal lines between the elements of V Corps fighting along Devil’s Den and Little Round Top and II Corps along the central portion of Cemetery Ridge. 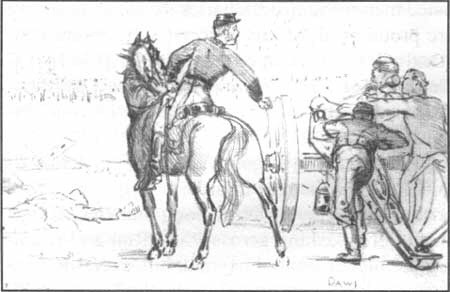 When Meade realized the seriousness of the situation he gave Sickles’ free reign to call for reinforcements from Harry Hunt’s Artillery Reserve as III Corps had only batteries organic to it. Those five batteries were in the think of the fighting providing invaluable support to Sickles’ hard pressed and outnumbered corps. Firing canister they cut swaths of death and destruction through the massed ranks of wildly cheering Confederates of Kershaw and Semmes and Barkdale’s brigades of McLaws’ division. The Confederates believed that they had cut the Union line in half and advanced through the Peach Orchard and across the Wheat Field toward Cemetery Ridge. The action of McGilvery was another example of an officer who had the trust of his superiors who did the right thing at the right time. It is an example of an officer used the principles of what we today call Mission Command to decisively impact a battle. 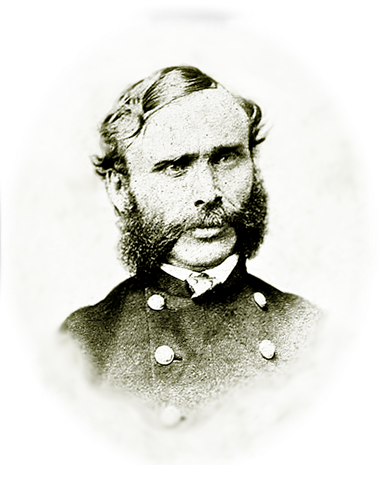 McGilvery rose higher in the Federal service and was promoted to Colonel and command of the artillery of X Corps. He was slightly wounded in a finger at the battle of Deep Bottom in August 1864. The wound did not heal properly so surgeon’s decided to amputate the finger. However they administered a lethal dose of chloroform anesthesia and he died on September 9th, the Union losing one its finest artillerymen. He was buried in his native Maine and the State legislature designated the first Saturday in September as Colonel Freeman McGilvery Day in 2001.